I knew George when he was selling bougatsas in Kamares, Sifnos when I was a lowly folk-singer. His boss at Aegean Thesaurus, Apostolis Dimopoulos is the son of a legend in the travel business. Apostolis was not planning on being a travel agent like his father, though he had worked in the family business since he was a child. He was going to be a philosopher. But making a living as a philosopher is tough these days so when Apostolis moved to his wife's island of Sifnos, he accepted his destiny and started Aegean Thesaurus Travel. Most island travel agencies are really just ticket offices for the ferry boats. But Apostolis turned the little stone building that housed his office, into a high tech computerized travel center with DSL lines, faxes and phones, and from this little island he is able to book his clients all over Greece. If Sifnos is in your plans then go with Aegean Thesaurus. Even if it is not in your plans I still recommend them. If they are not the best travel agency in Greece they are crtainly one of the top three! and Troy and Tyler Tucker..
Just a quick line to say thank you for all your assistance regarding our recent visit to Sifnos. We had an absolutely superb few days on your beautiful and friendly island which reminded me of how all the Greek islands used to be some 35 years ago, however, Sifnos will remain our secret jewel and we would hope to return whenever possible. Thank you again Giorgos for all your help in planning this visit, for making it stress free and for your professional attitude throughout. Lynne and I will certainly recommend Aegean Thesaurus Travel to family and friends and of course your good self as a reliable and friendly contact. I wanted to thank you so much for helping organise such a superb trip. I particularly wanted to pay compliment to you for organising changes so promptly for us during the trip and providing absolutely impeccable service. Rest assured Martine and I will be recommending you to each and every person intending on visiting your beautiful country. We're back home in New York now, on a chilly rainy day, and wish we were back in Sifnos! Everything went very well on our trip, in good part thanks to you for helping us plan all the best places to go. Sifnos turned out to be our favorite location because of the beautiful little villages and chapels in the hills. If we could return to Greece, your island would definitely be where we'd like to spend more time--and we'd definitely come back to you to arrange it. We've sent quite a few recommendations to Trip Advisor. One very special place that we'd like to mention to you is the Aetoma Hotel, where you managed to book us into their wonderful top-floor suite with roof terrace. The proprietors there, Panagiota and her son Akis, are both charming and unusually helpful. They told us they've had good experiences working with you. We pondered a bit how to enter our recommendation for Aegean Thesaurus, so that as many people as possible would find it, and we finally decided to put it in a forum labeled Review of Aegean Thesaurus Touring Company. A copy of our entry is below. Carry on with your good work, Barbara. “As a result of reading these great reviews of Aegean Thesaurus, my husband and I decided to use them too. It was the key factor in the success of our first trip to Greece this May. We are experienced independent travellers and have been to many parts of the world without using a travel agent. But this time news reports of strikes and demonstrations, plus incertainties about future ferry schedules, made us feel that we needed a capable local facilitator in case complications arose. We were planning a trip that included not only Athens and the Peloponnese, but also two islands - Santorini and Sifnos - that are not well connected even in the best of circumstances. Barbara Vaccarella at Aegean Thesaurus (located in Apollonia, Sifnos) turned out to be the person who helped put it together. She is very knowledgeable, responds quickly to e-mails, anticipates concerns, makes suggestions that improve your own plans, and is flexibly efficient when changes become necessary. When we were in Sifnos we dropped into the company office and gained the impression that the rest of the staff would also provide excellent service”. Our first trip to Greece was absolutely wonderful!! The islands we stayed on are beautiful!! We had a fabulous time and enjoyed all aspects of what you had organized for us .From the suggestions on phone cards to those on walking tours. Our stays in Athens were terrific as were each one of our visits to the 5 islands that we spent time on. The hotels you booked for us were perfect and each one of them met our needs. Although we had some trepidation about visiting Greece, we quickly learned that there was absolutely no reason for it. The people of Greece are hospitable, friendly, gracious and they all made us feel so welcome. Never once did we feel uncomfortable and never once did we feel we were being taken advantage of, like we have in our other locations. The food was fabulous and always fresh and not once did we have a bad meal. We particularly liked the fact that there were no fast food places which sadly are now the norm in our Country! We enjoyed staying in the family owned hotels you selected for us and were very impressed that your selections had us right where we wanted to be! Not close to any noisy areas for sleeping purposes yet just a short walk to the local attractions and restaurants and other amenities. We especially enjoyed staying at the Nissaki Beach hotel and the Petalli Village hotels, our two seven day stays! They are very well run and nice facilities... just perfect. The only real disappointment we had with our holiday was when we arrived in Sifnos, where your office is located! We asked the nice young lady who greeted us when you would be available so we could meet and thank you personally. It was then that we realized how virtual our world really has become? She told us that you were based in the UK and would not be there! One of our questions of you was going to be how you had leaned to speak such excellent english!! Now that we are home, Barb is asking me where we will go next year!!! Given that my current philosophy is not to return to the same place twice. (only so much time and money and so much to see!!) Dare we ask you if you are familiar with or can suggest other places we should visit? Thanks again for all your help, wonderful suggestions and professionalism. You should know that in all of the traveling that we have done we have never used a travel agent. We've always booked on our own. Our first impressions with the service you provided us are just... excellent! 1. You! It was enormously reassuring to be able to rely on your familiarity with all the places we might want to go, and to feel that you were talking to me, a particular person, rather than a generic Tourist. The itinerary we came up with together turned out to be just right for us...we did everything we'd hoped to do, and more, without feeling rushed or "If this is Wednesday, it must be Delfi." 2. The various transfers, which made life very easy. 4. Staying at the Delfini was, for me, like living in one of those posters that you see in every Greek restaurant in NYC. It was exactly as I had imagined, and perfect. George and Pepi, the owners, were also perfect. 6. Pension Dafni in Nafplion was completely charming...we'd have been happy to stay there for a year. There are lots more superlatives where these came from, but I'll stop now. Thanks again, Sandra. All the hotels, ferry's, tours, and transfers were flawless. The combination of ancient ruins, fantastic food, beautiful islands, and great beaches made for a once in a lifetime family experience. Your assistance was key to making it be so good. I wanted to thank you for your website! Because of your strong recommendation, my husband and I chose to stay in Sifnos for our two week vacation in July. We wanted to go somewhere relaxing and beautiful, hopefully unspoiled, where we could take in the sunsets at night and appreciate what the island had to offer by day. We went to many of the places you wrote about. The Old Captain quickly became a favorite hangout in the evening and breakfasts were usually taken at Cafe Stavros. We ate at every restaurant we could find in Kamares, where we stayed (at the Morfeas Pension) and our favorite stand-out came to be Kafene's. It was a dream vacation and a wonderful introduction to Greece. There are so many islands in Greece, choosing a destination can be quite overwhelming and your website really helped point us in the direction of where to go for the first - and hopefully not the last time. I booked our room through the Thesaurus Aegean Agency and Barbara was extremely helpful. She answered my many questions and took care of all our reservations to and from the port as well as taxis to and from the airport. Thanks again, Matt. You did good! Thanks so much for all of your help with our recent trip to Greece. Your choices for our accommodations were excellent, and your help sorting out the timing of our stay could not have been better. We are already planning our next visit to Greece, and will be sure to contact you when this dream can become a reality. Best wishes, and thanks again from my family. Hi Sandra.... sorry not to have written before now. However, many many thanks for our trip to the Greek Islands. We had a fabulous time. Truly a very memorable holiday in Greece. We have come back China safely. Everything is so perfect and wonderful for us in these days when we stayed in Greece. It's really a memorable honeymoon for me and my wife. And also for my friends for their marriage anniversary. The hotels are perfect. The transfers service are very good. We were enjoying our time in Greece very much. We even don't want to go back. Thanks for your service and arrangement for us. If we want to return Greece, we will definitely choose you as our travel agency. We will recommend Aegean Thesaurus to our friends and other Chinese people too. I just wanted to say thanks again for organising our Greek holiday! The transfers, the hotels and everything else you booked for us were great and everything worked out as planned. It was great just being able to relax, knowing that everything has been taken care of. Our vacation on Santorini and Sifnos was totally wonderful. Our family had a great time enjoying these beautiful islands. We are still in awe of the natural beauty and the friendliness of the people we encountered. My husband and I will be back for more island hopping in the future. I wanted to say a big "THANK YOU" to you for making all the arrangements! The trip was flawlessly planned from you, you selected the nicest taxi service, the most appropriate ferry rides and the most economic appartments for us. Unfortunately we did not meet on Sifnos, as we only stayed a short time. I hope to work with you in the future and will recommend you to any visitors to your beautiful country. I just wanted to take a moment to thank you for putting together the most wonderful and perfect honeymoon in the Greek Islands for us! Everything you did was right on point, we had absolutely no hassles, frustrations, or glitches. We enjoyed every minute of our trip and am so appreciative for the wonderful hotels you chose and for all the details to be just perfect. It was a fairytale honeymoon for us and we absolutely loved Greece! Thanks so much for your kindness, organization, and precision. I will highly recommend your services to anyone I talk to and will post positive praise on a few travel sites as well. This agency is top-notch--friendly, efficient, dedicated, and honest. I used Aegean Thesaurus this year for my four-week study abroad program (University of Utah), which entailed numerous bookings for hotels, transfers, ferries, etc. Not a single detail was overlooked, and on the few occasions when adjustments had to made (once because a student arrived late from the States and once because sites were closed due to the Greek elections) a simple phone call (in one instance) or email (in the other case) to the agency brought an immediate response and remedy. And--get this--such excellent service cost no more than my study abroad trip the previous year, when I made all of the arrangements and bookings myself! Apostolos, the head of the agency, handled my study abroad program, but after my students went home I spent another two weeks in Greece with a side-trip to Turkey, and the bookings for the Greece-part of this extra time were handled by Sandra. Once again, every detail was attended to, and everything was as smooth as could be. I'll be using Aegean Thesaurus again next year for my study abroad program. I just wanted to let you know that our trip to Greece was amazing!! My boyfriend and I had a wonderful time and I could not have been more thrilled with your services! The hotels were amazing and the people were all so friendly and accomadating. My trip would not have been nearly as nice without your advice. Turns out the ferry situation ended up working out. I called your agency twice just to check in but I ended up fixing things up. reccomend you to my friends and clients. Thanks again. I am writing to complement Barbara of Aegean Thesarus Travel on the amazing trip she put together for my mother and I. I found her through your website, and after reading testimonials, I was confident that using this agency would be key in making everything perfect for our trip. I started emailing with Barbara mid May about my dream trip, a graduation gift from my parents. She was so incredibly helpful in putting together an itinerary that fit perfectly with everything I wanted. She was very patient and thorough, and I felt through every step of the process that she was hearing exactly what I was saying, and that she made every effort to make things perfect. Upon our arrival in Athens, and meeting our taxi transfer (who had to wait on our very late plane! ), we could see that everything was going to be seamless and easy. We spent a total of 23 days in Greece, seeing Athens, Sifnos, Santorini, Mykonos, and Naxos. Each taxi transfer, ferry trip, plane ride, and hotel reservation was perfect and incredibly easy, the way a vacation should be. Any problems that arose, we were able to contact Barbara, and she made it just seem to go away, and always had a great solution. I have already recommended her to many people I have met, and cannot stress enough how fantastic she (and everyone else at the agency) is, and how amazing our vacation was. If we had not had her recommendations or aid when we had a ferry situation go awry, I cannot imagine how I would have dealt with figuring out a solution. In sum, enough compliments cannot be said, she is fantastic and I will continue singing her praises to anyone who asks (and perhaps even those who don't). I thank them so much for the amazing assistance and the trip of a lifetime!! Also, thank you so much for all the information on your website. I printed hundreds of pages and took them with me. I had a nice little packet for each place we went, and felt so confident in the choices that we made since we were so well informed. In fact, we took to calling you "Uncle Matt" in public instead of sounding creepy when saying "the guy on the internet says this is a good _______ to go to...". Thank you for all the amazing recommendations, and most especially for turning us on to Barbara at Aegean, and also Kostas at Byzantino. He is such an amazing man, so smart and helpful. We sat and talked to him for hours on 2 different occasions, and the two pieces we purchased from him will be treasured forever as mementos. Thank you so much for all the help you provide to people interested in traveling to Greece. I have already recommended this website to countless people. You do a really great service to travellers, and to Greece. Thanks again! WELL WE ARE BACK FROM OUR HOLIDAY AND STARTING TO SETTLE INTO THE ROUTINE OF WORK AND GETTING USED TO THE COLD WEATHER AGAIN (8 DEGREES ATHE MOMENT AND HAS NOT STOPPED RAINING FOR TWO DAYS). BUT WHAT AN EXPERIENCE WE HAVE HAD. I JUST LOVED THE ISLANDS WE SAW AND HOPE ITS NOT THE LAST TIME WE VISIT. THERE IS SO MUCH TO SEE AND SO LITTLE TIME. AFTER A LONG FLIGHT 22 HRS TO HEATHROW/LONDON, 8 HRS STOP OVER THERE AND ANOTHER 5 HRS TO ATHENS. WE FOUND OUR WAY BY BUS TO HOTEL ADRIAN FROM THE AIRPORT QUIET EASILY, AS IT WAS EARLY ON SUNDAY MORNING THE STREETS WERE QUIET IN THE PLAKA WITH ONLY A FEW PEOPLE AROUND PREPARING FOR THE DAY, GIVING US A CHANCE TO WALK AROUND BEFORE THE MARKETS OPENED AND CROWDS BEGAN. I LOVED THIS. YOU TIMED THE FERRIES PERFECTLY TO GIVE US AS MUCH TIME AS POSSIBLE ON EACH ISLAND. THE ACCOMODATION WAS MORE THAN WE EXPECTED. I WAS SURPRISED WITH EACH ISLAND HAVING ITS OWN CHARACTER, AND WE HAVE SPECIAL MEMORIES OF EACH. WE RODE MOTOR BIKES EVERYWHERE, SAW MANY RUINS, TEMPLES, CHURCHES, MARKETS, SHOPS, OLYMPIC VENUES, WE WALKED OVER COBBLESTONES OF EVERY DESCRIPTION, GOT LOST DOWN SMALL STREETS, RODE DONKEYS, CLIMBED VOLCANOES, CLIMBED MANY STEPS, SWAM IN HOT SPRINGS, BEACHES WITH WHITE SAND, BLACK SAND, PEBBLES, AND SPARKLING BLUE POOLS, PLAYED BEACH VOLLEYBALL, WE CLIMBED MOUNTAINS AND GORGES, EXPLORED CAVES, WE EXPERIENCED TWO WEDDINGS AND GREECE WINNING THE SOCCER WAS ANOTHER HIGHLIGHT, WE ATE AT MANY RESTAURANTS AND MET PEOPLE FROM ALL OVER THE WORLD AND YOU WOULDN'T BELIEVE SOME FROM 2KM FROM WHERE WE LIVE IN MELBOURNE. MOST OF ALL WE LOVED THE WARMTH, AND PRIDE OF THE PEOPLE WE MET, AND NOW AS WE SIT AT HOME WATCHING THE OPENING OF THE OLYMPIC GAMES ON TV, MY HEART IS FULL OF PRIDE FOR YOUR ACHIEVEMENTS AT THIS EVENT, AND KNOW THAT WE HAVE EXPERIENCE JUST A LITTLE BIT OF THIS. AFTER GREECE WE WENT ON TO ITALY FOR 1 WEEK, VISITING ROME, FLORENCE, PISA, VENICE, NAPLES AND SORRENTO. THEN TO LONDON AND PARIS FOR A WEEK. If you have any other advice or suggestions we would be glad to hear it. ...after reading your pages, we booked a holiday in Greece through Aegean and were extremely satisfied with their arrangements. Ths was our first visit to Greece and we hope we can make it again in the future, it was a great experience. For us the main deterrent is the long flight and jetlag but that's the norm when you live in Oz. I wanted to write and thank you for your web site and all the help it provided in my recent trip to Greece. I took your advise on a lot of items and the whole trip was wonderful. We can't say enough about the service we got from Nic, who works for George the famous taxi driver. He picked us up at the airport and it was great after a long flight to get into a clean, well kept taxi. We then spent 10hrs with him the next day as he took us all over the city of Athens. We could not have seen the amount of things we did and felt as comfortable in the city without him. We then spent 5 days on Sifnos and it was terrific. We stayed at Hotel Delfini and I would recommend George and his family run hotel to anyone. We went toward the end of the season when it was not very crowded but the weather was still warm. We stayed at the Volcano Views on Santorini and it is awesome. The hotel really is on the cliff. Of the the two islands we enjoyed the pace of Sifnos better but Santorini was worth the visit. I also would recommend Aegean Thesaurus Travel to anyone going to Greece. They made the hotel and ferry reservations for me. They were also invaluable when I ran into a problem with my credit card. If I had used a US travel agent I would not have had anyone to turn to while on an island in the middle of the Mediterranean, but they helped me resolve the problem, and let me get on with my vacation of a lifetime. Thanks again for your web site and all its information. You will not remember me but we emailed a lot back and forth in March and April of this year. After the calamities in the Middle East and the Holy land we switched our itinerary from there to focus more on Greece. You provided us information on travel in central Greece as well as some Greek Islands. After a two week Holland America cruise with stops in Santorini, Istanbul and Ephesus as well as other Black Sea ports, we wound up in Athens just in time for all the riots and confusion in mid-October. We followed your advice and stayed at the Attalos Hotel. As you noted the location is great and the staff very friendly. The beds were harder than we are used to but we found that at other places we stayed in Greece. The hotel view of the Acropolis is stunning from the hotel's top floor. I still shoot slide film because the colour and depth in photos is much better than digital. I have one night shot of the Acropolis which I may enlarge and mount on a feature wall in our home. We followed your advice and chose Sifnos as our island destination. We used Ag Thesaurus (AG) Travel for our Greece travel plans. They chose Chat Tours for our 4-day bus to the Meteora and peloponnesus area. Our guide and bus driver were fabulous in getting us to all the sites before they were closed by strikes. This meant altering our schedule to accommodate these last minute surprises. It was great to visit the Meteora and other stops and see how much has changed from 35 years ago when I was last there! Chat did a great job because talking to other tour groups they missed seeing the monasteries, museums, etc because the bus tour operators did not change scheduling to take into account the strikes. AG really pulled the iron out of the fire to get us to Sifnos. With the ferry workers striking 9 days instead of 2, our Sifnos trip was in jeopardy. They suggested we fly to another island but, based on what you had told us earlier, we had our hearts set on Sifnos. We had planned seven days but wound up with five. Thanks to their knowledge of local services during the ferry strike, they arranged for us to fly to Mykonos and then take a water taxi to Sifnos. (I was in Mykonos 35 years ago, I would not want to go back there again, too touristy). We stayed at the Morpheus Pension in Kamares. The owner was great and made us feel at home. We had a lovely suite with a big verandah. We really liked Sifnos and plan to go back again. The people were great, hardly any tourists, and the weather around 20 degrees. Unfortunately my wife had trouble with her feet so we did not see as much of the island as I would have liked but it was still very enjoyable. In one of those strange travel events, I stopped by a cruise centre in our local mall, to get a new Holland America booklet to start planning our next trip. Lo and behold, I met a representative who worked on Holland America cruises a few years ago. She met her husband while working together. He actually proposed to her, after a long uphill climb, to the church high on the mountain overlooking Kamares. Small world! I do not know if you have read all of the above but myself and wife extend our heartfelt thanks for all your travel advice which really made a big difference in the success of our recent trip. We would like to thank you all very much for all your help during our stay. I will certainly use the company again when I return and thanks to the really useful information I found on your website I will feel confident to explore some new islands next time. Thanks again for putting out all that information, it was really helpful and our trip was benefited immensely by it. Drop me a line when you get back home and we will grab a beer or something. customers, we would be glad to recommend you! My wife and I spent a little over two weeks traveling around Greece last month. We are from Michigan. It was our first time to Greece and we used your travel guide to help us with planning and referenced it a lot while in Greece. We booked everything through Sandra at Aegean Thesaurus Travel Agency. She was great working out the details of the hotels, car rentals, transfers and ferries. We started in Thessaloniki (my wife had a conference at the University) and drove to Meteora (spectacular), Delphi (what history!) and Athens (skipped all of it:). We took the overnight ferry to Crete and spent time in Chania (stayed right on the harbor) and Iraklion. From there we went to Santorini and Milos (wonderful hotel in Pollonia). Yeah, it was high season and Santorini was packed but we decided that we couldn't come all the way to Greece without seeing it. Next time we'd skip it because Crete and Milos were so amazing. I think Milos was our favorite - we drove around to several beaches and took the sea kayaking trip guided by Rod. We tried to swim at Papafrakas but there was no one else there and it was a little intimidating to us first timers. We had a great time everywhere - the people, culture, food (I had so many gyros), beaches and history were all top notch. Your guide was like our Greek bible while we drove around to some of the beaches, towns and restaurants you recommended. We can't wait to go back and visit some more of the 'off the beaten path' places. We only had a couple weeks because I had to get back to work but we would have stayed much longer if possible. I made a donation to help with the expenses of your website because it was so valuable to our on our vacation. Again, great job with the website - keep it up! in Santorini. Everything worked out perfectly and we had a great time. The hotel was fantastic - probably the nicest I have ever stayed in. is currently arranging a trip to Santorini. Thessaloniki, Athens, Sifnos and Milos. We chose places you suggested, and I wanted to give you feedback. Attalos hotel – very glad we stayed here. Great location and wonderful rooftop lounge. Clean, friendly. Akrogiali Pension in Sifnos – Absolutely wonderful. Sparkling clean, gorgeous view (we took an apartment with full kitchen for the week and loved it) and right on the sea. We were there in May and got to see the town dust itself off in preparation for the upcoming tourist season. That was an experience well worth it. Our landlord arranged a little party to get our infant together with theirs, inviting a few friends. They also made a gift of some lovely pottery made by the husband when we left. On Milos we stayed at the Anemoessa Studios. The experience was incredible. You need to add this one to your list. The place is pristine – seafront – on a lovely small harbor and steps to swimming. It is something out of a picture by Edward Hopper. We couldn’t believe our luck. The landlords were incredibly helpful, especially since there was a ferry strike and we needed to change all our reservations for the return trip. The travel agency (Aegean Thessaurus) worked with us above and beyond what we might find in the States. We loved the town of Pollonia. Again the people were friendly and caring. There were many misty eyes when we said goodbye. So, Matt Barrett. Thanks for your website and for a wonderful trip to Greece. to believe we are back already, but we have great memories. I am sure that Greece will be on our minds for a very long time. I just wanted to tell you what a great trip we had and how much we appreciate your help. You and Ada and Dimi really made things go well, and we are grateful for your advice and suggestions. Glaros in Piraeus was just fine for an overnight stay and an early departure. Margando in Sifnos was wonderful (even with that long climb up the hill). Stella and Niko were wonderful and were able to spend some time with us, which I’m sure is not possible now as the season begins. The breakfasts were great, the view from our top floor deck (room 12) was beautiful, and we really enjoyed our stay at their hotel. We had some wonderful food at Ouzerie Kamares (two or three times), Simos, Boulinas, the taverna on To Apokofto beach near Chryssopigi, Manolis in Vathi, Da Claudio, and Absinthe, which both you and Stella recommended. Meropi was a big disappointment. In Milos, we were very happy at Portiani, had a great view from our outdoor deck. The people were very nice and helpful. Good meals in Adamas at Kynigos (two or three), El Greco, and Navagio, and very cheap and well-poured Johnny Walker and Metaxa 7 Year at the bar on the square translated as The Milos - every evening! Also great lunches at Captain Nikolas in Polonia and Sirocco on the beach near Paleohori. Saw beautiful beaches including Sarakiniko, Mytakas, and Paleohori. Please pass these endorsements to your clients. And I am sending a copy of this message to Matt Barrett so that he will know how helpful you were and also have some feedback on some of his and your recommendations. I hope we will be back to Greece and, if so, we will call on you again. My parents had such a wonderful time! They said it was the best anniversary they've ever had! P.S. I can't wait to plan my honeymoon in Greece !!! arranged for us in Athens, Santorini & Sifnos. All places were of excellent standard and we were very comfortable - the people at Geronti pension are especially nice, and made us feel very much at home. I think we were in the No. 1 location on the island - the view from the verandah across the valley and out to Anti Paros and the other islands is really superb. I didn't get the opportunity to call in and see you personally - I don't really have an excuse for that. If Julie is still with you (the chap I spoke to when we arrived said she had gone back to the States, but I didn't ask if it was a permanent arrangement or not) please thank her also for her efforts. You are very professional at what you do, and very honest. When you buy over the Internet you take your chances , but I was very comfortable in my dealings with you. I didn't even ask for the refund for the ferry tickets - your lass chased me along the street to get me to come back so she could return the money to me. If you need a reference for somedoubting client, I will be happy to relate my experience of my dealings with your Company. Thank you again for you help in making our trip to Greece so enjoyable. you are finding time to relax after the busy season. like or if places are open. I told him how helpful you are. I wish I needed you services again. Maybe one day. I cannot thank you enough for all the help, insight, and references we received through your website. My wife and I just returned from our 25th wedding anniversary trip to Greece and it was absolutely perfect. I poured over various websites for months prior to our trip and kept returning to yours. Your tips on travel agents, hotels guides, transportation, island synopsis were invaluable. We stayed at the Electra Palace in Athens, Dana Villas in Thira, and Alkyonis Villas in Sifnos. They were all exactly what we expected because of your descriptions. Clean, Friendly and the staff was amazing. Maria at Alkyonis even lent us some of her personal towels for the beach because we didn’t think of bringing some and Franko at Dana Villas copied a CD for us because we liked the music. We used George Kokkotos Taxi for our port transfers, (unfortunately didn’t get to meet him though). Your tip about arranging the port transfers was right on. We arrived in Sifnos at 04:45 in the morning. We were the only ones of about 30 people who had a taxi waiting….Magic! In Sifnos we drank Ouzo on the beach of Kameras at the Old Captain, and ate at Simos and Claudio’s and Manolis. We had the Tomato Keftades in Santorini, by the way you may want to add a restaurant called Rimini in Thira to your restaurant list, excellent! In Athens we ate at the Platanos and Byzantino restaurants and for our last night on the rooftop Restaurant at the Electra Palace. I guess you are getting the point, all above were recommended through your site. We had the most magical time, it was everything we hoped for. We want to thank you for the effort and dedication you put into your web site, I have no doubt that our trip would not have been as good without your help. have the chance to visit the islands again in the future. hope that you will be able to arrange our holiday once again. Sorry we were unable to meet you, but hopefully we can meet next year. Thanks again for your time & patience. content to spend a slower day at Io. Athens! Room 610 at the Atollos is a delight! history of your country will always be a beautiful memory for us. We will be happy to recommend you and your agency to any and all people. say thank you, thank you, thank you! May Aegean Thesaurus and you personally prosper in 2001.
besides the tourboats and buses, was wonderful. Aegean Thesaurus. They were great and made it so easy. The details you provide are essentials as without them we would have missed our ferry to Santorini. Let me explain, you advised that we should book our arrangements thru a local travel agent instead of our own as the ferry departures might change, well in our case it did, thanks to your advice our agent, Sandra at Aegean Thesaurus Travel, faxed over to our hotel the change in ferry departure time. How I planned our trip was to prepare my own itinerary, with hotel names, Chat tour I wanted which I found online then faxed over the details to Sandra and she gave us a price...............To make it easier for us, we had George’s taxi pick us up at the airport, as well as bring us to the ferry......the rest of the time in Athens we just walked as the hotel Attalos is close to everything. I keep telling my friends to visit Greece as it’s the most beautiful place in the World ! the visitors...it is not honestly reccomended to anyone, except insiders. Atacama and Patagonia, in the southern tip of america. You can see them if you like in WWW.ArchitectureWeek.com/2001/1003design. Aeagean Thesaururus as travel agents to all discerning travellers to greece. Beach and Akrotiri excavations, but two days were just about right. beaches. We also went on boat trip around the island. It was worth every cent of 20 EUR. We read in one café that tourists on the island are divided something like: 50% Greek, 20% Italian, and then all the others. Great. We add 0.01% of Slovenes to that. Wanted to give you some feedback/updates, etc. to help folks. We used Aegean Thesaurus Travel in Sifnos and it worked very well. Our guy, Georgios, was unassuming, flexible and quite customet oriented. Not really sure of the deal or savings but short of doing all the research, haggling, and calling all over the islands, it was the way to go. We went Athens to Sifnos to Santorini to Naxos to Athens. If it doesn't create a stampede to Sifnos, we'd have to say that Sifnos was our favorite. It isn't for everyone and doesn't offer the higher end accommodation or restaurants, etc. But that wasn't why we were going in the first place. We stayed at the Villa Irini and it was perfect: off the street and a kind of retreat from the rest of the world. Very quiet. What a great island....walking, sitting in tavernas eating, quaffing and people watching, and beaching on the loneliest beaches that we found (not the prettiest or sandiest, that's Naxos, but loneliest). And the bus sytem was all you needed. From Faros to Vathi to Kamares, no need to rent. Santorini was a bit of a disappointment. A must see but...we found it perhaps a bit too touristy and a lot of development underway to make it more so. Stayed at the Vila Mathios. People should know that there has been an expansion there since your website report. Still great family-run place but we found it maybe a bit too big for Kostas et al to maintain the same level of service. You will need a car there as well. Not a 'short walk' to the beach. Naxos was fabulous. Stayed at Naxos Beach II near Agios Prokopios. Nice but needs a little attention despite only being a couple of years old. A little shorter walk there to a beach but, as your website suggests, Naxos demands a car or scooter anyway (although a scooter is not for the timid on the inland roads). We drove the interior and it was the highlight of the trip to Naxos! If we do Naxos again, we will stay in town and rent a car. Great beaches, spectacular water, breathtaking interior, and Naxos town was happenin' and fun. Stayed at the Attalos in Athens. We really liked the proximity to the Plaka and the market which was a real treat to see in action. All in all, your website was a great help. I'd highly recommend the Aegean Thesaurus folks making the arrangements. Thanks for the help. We will be back. Just another fan knocking on your door to say thanks -- for the website, the tips, et al. A couple of months back, my husband and I were planning a return trip to Sifnos in August (next month - YAY), when we came across your invaluable information. We are stuck in the outback of Mali in West Africa, so the internet is the only source of information. Wow, we hit gold when we found you. And of course through various links recommended by you, we came across a great travel agent. I'd like to ask you to recommend Giorgos Venios from Aegean Thesaurus Travel in Sifnos whenever you have a chance. It's many years since we've come across such an endlessly helpful, obliging and efficient travel agent. our trip to Athens, Sifnos, and Santorini in October. future. Keep up the great work! I just wanted to let you know that we are home from our trip to your beautiful country, and to thank you for making the arrangements. All the bookings went well. The taxi service is Athens was very dependable, when we got off the plane, there was a taxi driver strike, so we didn't know what to expect, and were relieved when we saw our name on a card, we would have had much difficulty using public transportation to find our hotel! The Jason Prime hotel is beautiful, with excellent service and breakfast. We loved the islands and came home with a nice tan. Naxos was a great choice for us, and we traveled all over with the car. Our daughter's wedding on Santorini was lovely, and we also enjoyed that island, we rode the donkeys up the hill several times! The Galini hotel had a perfect view of the sunset and the staff/owners were very helpful and friendly. We were very satisfied with all your bookings and the only minor problem with any, was that we didn't see the transfer person at the ferry on Santorini, but saw one with the hotel name on a card, and paid him 10 Euros to take us to the hotel as he wouldn't take the voucher. The only other problem (for your info for future bookings!) was that the beds in our room at the Astir of Naxos were extremely hard, though the hotel was lovely with large rooms and a balcony. Again thank you for all you did for us, you truly made us a beautiful vacation. I have been wanting to send you an email for a while to thank you. Western Europe and Southeast Asia, I finally made it to Greece, which also changed my life. whenever we're together and it has definitely brought us closer together. love will always be for the islands of Okinawa, but my affection for Greece is right behind. married and hopefully going on a "late" honeymoon to Greece in 2005.
creating such a wonderful memory for my family. Thank you. happier with Aegean Thesaurus or the information on your web site. Florida, we felt we were experiencing the real Greece for the first time. * The hardest thing to find on Santorini was a bad view. It was amazing. the street and knew it was time to find a place to eat. Just a quick note to thank you for helping to plan our trip to Greece. We have just returned having had a wonderful, hassle-free time, thanks to your careful organising. We enjoyed Naxos but Santorini took our breath away. The accommodation you arranged also made the trip special. The staff at the Porto Naxos Hotel greeted us like old friends and couldn't have been more helpful. Irene at the Atlantis in Santorini was fantastic and the view from our balcony exquisite. Similarly, the hotel you recommended in Athens, the Cypria, was good and ideally located. Our thanks also go to the driver you arranged for some of our transfers. Christofer Sitaras proved so helpful and reliable that we used him at other times. It's hard to believe that the trip is over but we will always have the memories. Now just to pay for it all. Our hope is to one day return and visit some of the other wonderful islands. If we do, I will be sure to contact you as I was most impressed with your service. Thanks again for making it a memorable trip. On June 27, 2003, I had a chance meeting at the Portland, Oregon with one of your customers who was just returning from a vacation you helped plan. I did not know this person, but they were so impressed with your arrangements, that I contacted you, explaining our thoughts for our planned April, 2004 vacation to Greece, and asking for your suggestions. Over the next few months, we e-mailed our thoughts, and the plan was modified several times. The final result exceeded our wildest expectectations. goats. In Naxos we were invited to a Christening at the taverna in the Alkyoni Beach Hotel. In Athens we took your suggestion and contacted George, the Famous Taxi Driver. In short, we experienced much of your country then we could have ever expected to. Our only regret was that we could not spend more days and travel to Sifnos and thank you personally. There is no doubt that if anyone ever asks for advice on traveling to Greece, we will immediately refer them to you. Also, please feel free to use us as a reference. My stay in Greece was wonderful. I thank you for your help in making travel arrangements. At the Hotel Cecil, I was given a room on the roof where I enjoyed the view of the Acropolis, and the hotel staff was friendly. I enjoyed the day excursion to the volcano island that you reserved for me in Santorini. And the taxi for my transfer to the airport came a little early, so I made it to the airport a little early. Thanks again for your assistance in making my vacation to Greece a wonderful one. We just wanted to thank you for helping us make the arrangements for our honeymoon to Greece. Everything was wonderful! The Electra Palace in Athens was beautiful and elegant and the service was terrific. We had a view of the Acropolis and Parthenon from our 6th floor balcony. We were even there during a full moon!! The Katikies Hotel in Santorini was like something out of a fairy tale! It was worth every penny we spent. We had champagne every morning with breakfast, which was served on our balcony overlooking a private pool and the caldera. We were treated like royalty. The Katikies was a very special experience. All of our drivers were either on time or early. The cars and/or vans were clean and the drivers friendly and polite. The entire trip was perfect from start to finish! Thank you again for all your help. Just a quick email to thank you for making our week on Sifnos a very relaxing and enjoyable experience. I must say that we really enjoyed your help in planning our trip and our stay in Platy Yialos where we found only smiling and very helpful people. Please pass on our many thanks to all at Akrogiali pension for their kindness and welcome. Many thanks also to Dimitris for his great multiple assistance and especially for helping us find what seemed to have been the only car to rent with two baby seats on the island. We could not find anything that we would have done differently if we were to plan the same trip again so I guess this is as close to a perfect holidays as you can get (minus two not so sunny days). We wish you all at Thesaurus every success, we believe that the quality of your service and the kindness of your associates (like our hosts in Platy Yialos) are a credit to your wonderful island. Hugues, Sophie, Matilda and Ronan. PS: We might be in touch next year as our young twins absolutely loved the beach in Faros and made the Kyklades Beach restaurant in Playty Yialos theirs. I would like to thank you for your excellent work on our travel plans. Everything worked out very well. We loved the location of our hotel in Athens and our cab driver was great! You were right - the standard room on the return trip was just fine given the few hours we had in the hotel. The hotel in Mykonos was lovely - a wonderful location - away from the town and yet close enough and the staff were wonderful. So nice to get off the ferry and have our drive waiting for us! The cruise was lovely. There was a bit of confusion when we first showed up - they seemed to think 2 of our party got on at Athens but they did get us squared away in good time. The hotel in Santorini exceeded our expectations! The view was awesome and the peace and serenity was perfect! Again thank you so very much for all of your hard work. Your choices were perfect for us - exactly what we wanted! We found the Greek people very friendly and so helpful. Just got back from Greece this weekend. I wanted to send you a quick note and let you know how great everything was. Everything went off without a hitch except for us missing a ferry from Santorini to Naxos but we got the next one with no problem. The hotels you recommended were great. We especially liked the Attalos hotel in Naxos. The hotel has a traditional taverna there that made it a perfect vacation spot. Thanks for everything and we will be sure to use your company on our next trip to Greece. We're back from our holiday, and I wanted to let you know what a wonderful time we had in Greece. Everything went perfectly. All our transfers went off without a hitch, and we felt our hotel choices were excellent. We particularly enjoyed our stay at Dana Villas as well as the Semeli. Those small hotels were very hospitable, and the service was the best! I am so glad that you sent this email because I had lost your email address. We wanted to thank you for helping us plan our Greek island honeymoon. It was truly spectacular. Mykonos was our favorite island, but each island was unique and beautiful in it's own way. The itinerary was really great because the islands that you helped us choose were all very different from one another, allowing us to enjoy a true Greek island experience. Initially I was a little concerned because we incorporated so much traveling into our trip (flight, ferries and rental cars) but everything went off without a hitch due to your excellent planning. Thank you for everyting. If we ever plan another Greek island vacation we will be sure to use your agency. I'm sorry for the belatedness of this email. I just wanted to thank you for helping us out and planning all the arrangements for our trip to Santorini. We had a wonderful time in Greece and everything worked perfectly for us to get to the island. We had an awesome time on Santorini. The hotel you recommended us, the Aegean Plaza, was really great and the staff was very friendly and helpful. Once again, thank you for all your work for us! Syros (Syrou Melathron): perfect, absolutely splendid hotel, we were told the best on the island and we were not disappointed! Santorini (Loucas): great views alongside the caldera, but a bit noisy at night, there is a bar upstairs, and the gentleman at the reception was not friendly at all. Naxos (Iliovassilema): clean rooms, good breakfast, nice people, the owner even gave us a lift to the port, only downside is they charged extra for A/C, which I find a bit unusual, but after all it was 4 Euros well spent at +30 degrees Celsius. Samos (Samaina Inn): obviously a 4 star resort, warm welcome, spacious rooms, unfortunately the food was terrible (little choice, no taste etc) so we ate out almost every morning/night. There you go! We will not hesitate to recommend your services to whoever wants to go to the Greek islands. Just a quick e-mail to say thank you. It's been over a couple months since our fabulous trip to Greece. We made it home safe and sound. Just wanted to touch base with you and give you many, many thanks for all your work and effort put into helping me put our vacation together. You and your agency were terrific. We had such a great time and it was wonderful getting to meet you in person. My only regret is that we realized to late that we didn't get a photo of the three of us together! 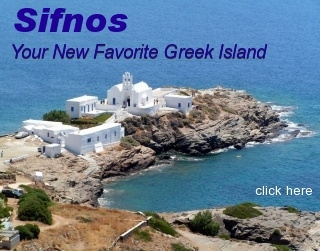 Your island home of Sifnos was fantastic. We so enjoyed getting to know people and the little town of Vathy was so peaceful and beautiful. Do you kow anything about the new resort being built there? I hope you have had a good holiday season. I guess things are winding down for you now. I would love to come back and visit again. 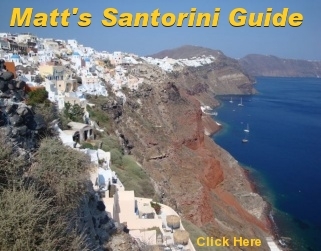 Spend more time on Santorini, Sifnos and maybe pick another island to visit. I plan to return to Athens within the year and will book again with you for reservations. You may want to recommend Kalamata as a not to be missed vacation destination. It is unbelievably beautiful and has a very active nightlife with many clubs and bars along the coastal road. A great hotel I found was the Byzantio right in town with very reasonable rates and clean lovely rooms. And I would recommend visiting Mani, an area with amazing scenic views and many lovely guesthouses and small hotels. But you probably know all this. Sono tornato a Milano e colgo l'occasione per ringraziarLa per la Sua gentilezza e collaborazione. Tutto e andato bene e Sifnos ci e piaciuta moltissimo. Qualora la prossima estate dovessimo tornare nelle Cicladi non manchero di contattarLa nuovamente. I got back into the States on July 14th....and now I'm back to work again. I wanted to send you an email to say "thank you," for all that you did for me and my cousin Joy. We had an amazing time in Greece and Rome....it was so much more than I had ever expected! My favorite island was Santorini, and the people at La Perla were wonderful. We had no problems with any of our hotels or travel while in Greece. Once we develop our 10 rolls of film, I will send you a picture of Joy and I enjoying our Greece vacation! Thank you again for all that you did for me. If anyone wants to go to Greece I will HIGHLY recommend them to contact you!!! We just returned from our vacation and wanted to thank you for arranging our stays in Greece. We had an excellent time and all the accommodations were great. a nome nostro e dei nostri amici vogliamo ringraziarvi per il piacevolissimo soggiorno che abbiamo trascorso a Sifnos. La casa era molto bella e ci siamo trovati benissimo, per non parlare dell'isola, davvero meravigliosa, nella quale senz'altro torneremo per piu tempo: infatti una settimana e davvero volata!! Grazie anche per la puntualita con la quale abbiamo potuto usufruire dei biglietti dei traghetti. Ti mandiamo un saluto da Milano, nella speranza di poterci mettere ancora presto in contatto. We returned home from our vacation last week and I just wanted to write you a short note thanking you for all of your help. We can't decide which part of our vacation was our favorite. Santorini was wonderful. The Kalimera hotel was nice and the location was great. The owner's son was quite helpful recommending areas we should visit, setting up tours and arranging a rental car. shop at the hotel......our families were delighted with their gifts. We rented a car and visited several of the sites on Crete on the way to Chania. There we hiked the Samaria Gorge which was definitely a highlight of our vacation. We hated to leave Crete, but we really enjoyed our short stay in Athens. Our hotel had a roof top bar where the view of the Acropolis at night was unbelievable. The following day we did a walking tour of the sites before we went to the airport. Again, thank you for all of your help....the locations and the hotels exceeded our expectations. I've been meaning to email you and let you know that we had a wonderful trip to Athens and the Greek islands. All went very smoothly with our ferries, flights and checking in at each hotel. Your recommendations and selection of the hotels were right on. The Attalos in Athens was perfect and in a great location to walk to the Acropolis and the Placa. Rooms are a bit small but on our return stay we got a room on the front side facing the street that was much bigger than on our first stay there. The Petassos Bay Resort was very nice and exactly what we wanted for a beach type of stay. It was nice to be able to have the pool and services of the hotel but then also just walk down the street to the beach and enjoy that. Having the bus stop right out in front of the hotel was very convenient too. Volcano View Villas had breathtaking views and the villas were very cute. I know this was my pick and a recommendation from a personal friend of mine. We enjoyed our stay there but if we ever return to Santorini I think we'd try and stay in Fira with a hotel that has a pool or in Ia so we could be closer to the center of things and not have to take a cab back and forth. Just some info for you if another person wants to stay there over your recommendation. It also seemed to be more for the couples or honeymooners and not for singles. The Mediterranean Hotel in Rhodes was perfect too. The only hiccup here was that they tried to put us in a room with only one bed and I said "No Way" and then we were given a room that was a smoking room but it did have two beds. We did not have the heart to ask for another room and suffered through with the heavy smoke smell for the first night and day. We loved that it was right across from the beach and ocean and then within walking distance to "Old Town" and other great shops and restaurants. We never had to take a taxi, bus or shuttle - we walked everywhere and truly enjoyed it. So I just want to send a huge THANK YOU your way for arranging all our great accommodations. You could not have put us at better hotels and locations and we appreciate this greatly since we knew nothing about the hotels or the location of each in regards to where they were on each island. We'd love to return and explore other islands in the future and will definitely keep your info to contact you again when we save enough again to return. I will also pass your name and info along to anyone that I might know or hear of that is planning a trip to Greece. Thanks so much for helping in making our trip to Greece wonderful, rememberable and such a pleasure. We did not want to leave and can't wait to return. Thank you for planning a wonderful trip for us! Everything was great! (There was a little hiccup at the Oia Mare with the rooms, but in the end it all worked out). We had a fantastic time (loved Fologandros the most -- great people at the hotel there) and, of course, Santorini. For those travelers you have that like hiking, you can tell them about the fantastic trail that goes all the way from Oia to Fira over the hilltops. They'll pass fresh thyme and mountain flowers as they walk! It rained quite a bit, but hey, Ian's English -we're used to rain! We just returned and I want to thank you for the excellent accommodations! We loved our hotels in both Mykonos and Santorini! The only thing we may have needed and I will remember for next time is the transfers to the hotel. Coming into Myknonos- Taxis are very tough to get there. But otherwise it is was an amazing trip and I wanted to thank you again for arranging it all! Thanks so much for planning our trip so wonderfully. Every hotel we stayed at was more than adequate. The Canavas II in Santorini was perfectly located in Oia. Not too far into the busy part of town but close enough to walk to and much easier to park the car. I know you were concerned that the hotel in Athens would be too tight for us but it was just fine and much better for us to be together the last nights. The only issues were the cars -- but it still worked out OK. They did not have the right car for us in Crete so they gave us a lower level car. I will let you know which one maybe tomorrow. We should be due some rebate if it was not the same level. We were very confused when we arrived in Santorini about the car. There was no one there to meet us and our voucher did not have the name of the local rental agent so we spent and hour making calls to Athens to try to find out who it was. Thanks again Barbara - everything went so smoothly -- you did a great job. Sadly, we are now back at home after our wonderful vacation. All of our arrangements were perfect. The Saga was exceptional in Poros. Neorion bay and Love bay are really nice in Poros. We took the short ferry ride for a day visit to Hydra. We truly loved Sifnos and the Thalatta studios in Faros. I'm sorry we missed you when we stopped in to visit in Apollonia. We visited Kastro, Platy Yialos and Vathy. We were thrilled to participate at the panigia Chrysopigi. We saw the ferry bring the icons to the church. It was very special. We also really enjoyed Notos villas in Adamas of Milos island. These accomodations were very superior. We were not able to take the boat tour around the island because there were not enough people, but we did see the Catecombs and Sarakoniko beach. We especially enjoyed the beach at Paliohori. Such an interesting island. I wanted to thank you so very much for all of your work to make our vacation very special. I will recommend you and your company to anyone wishing to visit beautiful Greece. We are home back in the States. Got in last night. Just wanted to thank you for all your help. The accomodations were great. Each hotel was exactly what we were looking for. The locations were perfect with unbelievable views. Thank you for all your help. We will be returning to Greece in the future. We loved it. Santorini is now our favorite travel destination. Next time we would like to see Rhodes, another island, and then back to Santorini. The ferry service is impressive, like a mini-cruise ship. Thank you again for making our vacation a great experience. We are safely back in Switzerland after a marvelous trip to Greece. We just wanted to thank you again for your professional and friendly help with planning our trip. Your effort enabled us to feel comfortable and relaxed throughout the journey. Hopefully you will hear from us soon for our next Greece vacation! We also wanted to tell you that the Acropolis Select Hotel, the hotel you booked us in as a change from the Cecil, was a really super hotel-comfortable, stylish and very friendly. Worth recommending to anyone. We are home again and have almost recovered from "jet lag," but I wanted to write to you to tell you how much we enjoyed our trip. Thank you very much for your able assistance in making arrangements for our visit to Greece. We especially enjoyed our stay on Sifnos at Thalatta Studios. The room was lovely and comfortable, and very convenient for us. Leah, who manages the studios for the owner, was very helpful and considerate as well as friendly. The several long walks through the countryside were delightful, and the hike to the monastary was well worth the effort! We had a perfect blend of active and quiet days on Sifnos and didn't at all regret that the ferry to Santorini was cancelled; it is a beautiful island and we hope someday to return to it. We have returned from our trip to Greece and I wanted to thank you once again for all the planning you did. I was sorry not to meet you while we were in Sifnos but you had gone to Athens and returned after we left. I hope you got the bottle of wine that Zefi, from Saga Hotel in Poros sent to you. They are absolutely delightful people and we thoroughly enjoyed our stay with them. If you have people going to Poros I highly recommend the Saga...Zefi & her husband Takis make all their guest feel at home. And their Monday night BBQs with food and dancing are great! The Windmill Bella Vista on your island of Sifnos was also a gem. We found Giorgos to be a great guy and the accommodation was super. We did however meet some older people who had booked through you that didn't want to drive and had no transportation and the walk to Apollonia would have been too strenuous. They were very disappointed. I believe they were going to try and find something in Apollonia. I guess you can't please everyone. We loved the quiet "remoteness" of the Windmill Bella Vista but I would not recommend it for people who are not active and adventurous. It was perfect for us and one of the highlights of our trip. You live on a most beautiful island and I hope to return some day. We had dinner one night at "The Beautiful Sifnos" right next to your agency, and he said in the 20 some odd years he had worked there he had never met anyone from Alaska. We had a nice chat with him and the Greek/Australian gal from the museum across the street! The people are wonderful in Greece. The Lilia in Pireaus was very pleasant. It was perfect for a Piraeus stay. Close to good tavernas and the marina. We did cancel one night there as Zefi got us reservations in Porto Helli. The Armada Festival in Spetses was on Sat the 7th. All worked out and Lilia refunded our money. The Armada fireworks show was spectacular! What a great way to spend my 50th birthday! We were a bit disappointed in the Galini Hotel. I think this may have been because of my own imagination and the pictures that you see in all the brochures. "The perfect balcony with the perfect view of the perfect sunset!" The owner/ manager put us in a bigger more private accommodation up the street and it was very nice but just not what I had mind for the grand finale of Santorini. But again, we found all the people to be warm, gracious and very friendly. In closing, I just want to thank you again for all your help in planning this "once in a lifetime", let's hope not, trip... We had a blast! I hope that you are doing well. We had a WONDERFUL time in Greece and will definately return. Thank you for making our honeymoon so great and getting back to us so quickly on the Naxos issue-- thanks for the refund-- that is great---- we loved Santorni so much that we decided to return and spend the rest of our honeymoon there. Thanks again and we really appreciate all of your help. We had a wonderful time in Santorini and Folengandros. The accomodations and travel arrangements were excellent. Thank you for your quick and friendly help. I will use you again on my next trip. Thanks. I read alot of your info before going to Greece(and sent you a couple of emails with questions you answered well ) and took my "Bible" of 50 printed pages from your articles.Your info and recomendations were fantastic so a BIG THANKYOU to you.WE loved our land tour of Greece and Athens was alot of fun. We stayed at Delphini on Sifnos and then Esperas in Santorini.WE LOVED Santorini and it was a real highlight.Also stayed at Sunrise in Lesvos for a week and it was as you said "one of the best places to stay on the Island".Hot pools were great and we did go to Vatera for a day drive ...fed the turtles and felt the water was at least 5 degrees warmer than at Molyvos.Thanks for all efforts in writing about the Islands etc as it was a big help .Also booked this part of our tour with Barbara at Theasurus Travel in Sifnos and she was absolutely wonderful with all she did.The Sardeles were as you said worth it and really enjoyed my meals with them and of course the ouzo!!! Thank you for all your help in making our trip to Greece a great success. We had a wonderful holiday and loved Greece, in particular, Sifnos. The cooking class was great fun and I have been experimenting with recipes. In Athens, we had dinner at Mandra, the food, service and entertainment were all good. Thank you for that recommendation. FYI: Even though we had an enjoyable day, we were disappointed with the bus tour, in that we only had an hour at Epidauraus and I have contacted Chatours to let them know that we didn't think that was long enough. We want to thank you for sorting out our accommodations on Naxos. We loved our new room, the gardens and hospitality. Thank you for helping pick the right areas and accommodations that suited our preferences. I would recommend your agency to anyone travelling to Greece.